I was fortunate enough to be able to cover my eighth NBA Finals: The Miami Heat against the San Antonio Spurs. Every year it becomes increasingly difficult to make ‘other pictures’. Between increasing restrictions, less access, more and more media and smart phones everywhere, making that different picture is next to impossible as we are assigned, lined up and fire away. The last Heat – Spurs game was an uncommon game seven and an even more uncommon chance for a team to repeat winning the championship but in a game that came down to the wire, the Heat accomplished just that. There seemed to be 1000 people on the court at the end of the game, through the trophy presentation and while the NBA does open the locker room post game, it's usually not until most of the celebration has subsided leaving few opportunities for capturing genuine emotion or reaction. The team, player by player, is shuffled off to the press conference to answer questions from 100 reporters with photographers clamoring up the sides hoping for a laugh or a gesture. While most photographers were packed up or sending those last few images hours after the game ended, I just wasn’t ‘done’. I wanted something else. I don’t know what I was looking for exactly, but after I scoured the locker room and the hallways I was going to take that rare opportunity to go back out to the court one more time and shoot some ‘details’; The Finals insignia on the floor covered in confetti, that odd friend photo (and yes, even I threw confetti in the air) in a near empty arena. Then, it happened. 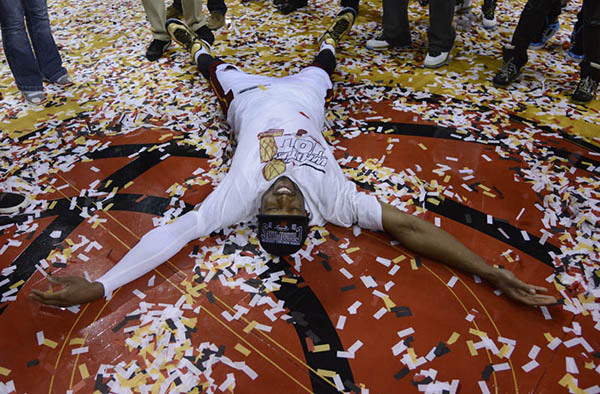 A small crowd came to center court led by none other than Heat guard Dwyane Wade who got down on the floor to lay on the Heat Logo and proclaim that since there is no snow in Miami, this was as close as he was going to get, proceeding to ‘make angels’ in the confetti. Outside all of the outstretched iPhones including one held by a knucklehead standing directly over Wade, I think I actually succeeded in making something different. And there it was. I was ‘done’ I found it. Rhona Wise covered the NBA Finals for european pressphoto agency. You can see examples of Rhona’s work on her Sports Shooter member page: http://www.sportsshooter.com/members.html?id=88.